This chapter will provide information on how to build and run your application. 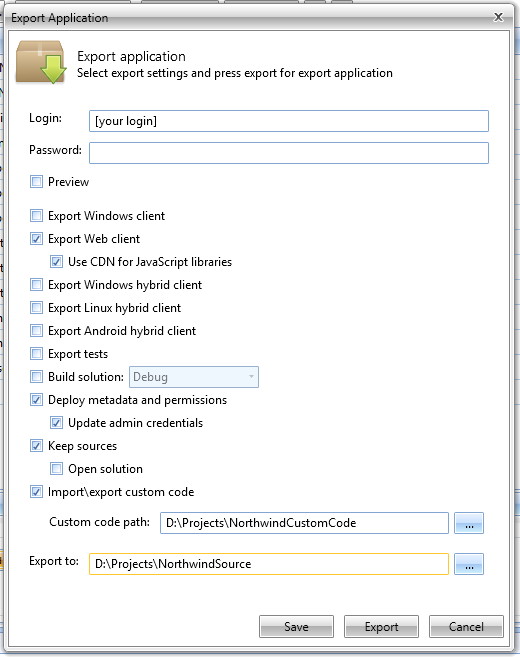 Open export Build->Export in main menu. Set export parameters as shown below (except Custom Code Path and Export To options, set your paths) an fill your login and password (on how to create a Code Cruiser account see Creating Account chapter). You can check Preview option. In that case all other options would be ignored and application will be deployed on Code Cruiser cloud for a limited amount of time. With this option there would be no data in database and no custom code (Order Report will not work). See Exporting Project chapter for details. (!) If you have any trouble with setting up developer environment Code Cruiser service could provide binary files. Check Build Solution option. Then you could start your application without building source code. Finally run Run.Server.IISExpress.cmd and Run.Client.Web.IISExpress.cmd to start your application (for more information on cmd files see Build And Run and Deployment chapters).